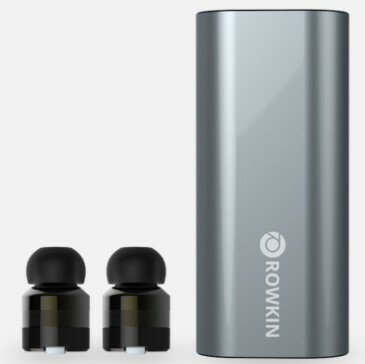 The Bit Charge Stereo Earbuds (Retail $129.99), from Rowkin, are a set of pretty nifty wireless earbuds, with a long lasting portable charging dock. They’re comfortable, really light weight, and perfect for the on-the-go music lover. The sound quality and noise cancellation are great, and they’re stylish too, available in 3 attractive, subtle colors (grey, silver, and 24K gold). Once nestled snuggly in the ear, they’ll stay securely in place, making them great earbuds for runners, or anyone with an active lifestyle. They’re also water resistant and sweat-proof, so you can use them no matter what the weather or activity. Having the compact portable charging station means you’ll always be able to give your earbuds a power boost without having to find an outlet. The earbuds are nice and small, coming in at just 0.55” in diameter and 0.82” long, and weighing only 0.18 oz. They come with 3 sizes of silicon eartips for a perfect individual fit in any size ear canal. One thing to mention, though they are small, they don’t have the ability to pivot the eartip and the body into a customizable angle, like some other earbuds, for ease of insertion into the ear canal. This won’t be an issue if you have large enough outer ears, so the buds can easily fit beyond the curve of cartilage. I have smaller outer ears, so I personally found it a little tricky to get them fully inserted. Once in, however, they were very comfortable and certainly had no chance of falling out. You may want to measure your ears before purchasing, if you think yours run on the smaller side. If you have medium to large sized ears, however, you should have no trouble just sliding the earbuds right in. As far as functionality, the Bit Charge Stereo Earbuds are multi-purpose and easy to use. The audio quality is clear and consistent, both through the speakers and the microphone, with noise reduction and echo cancellation enhancements. With a single control button on the end of each earbud, operation is a snap, whether you’re playing/pausing music, answering a call, or activating voice control to connect with Siri or Google Assistant. When both earbuds are paired via Bluetooth, music will play through both, but when you receive a call, or are using the voice functions on your mobile assistant apps, sound will only come through the primarily ear bud. My only beef with the functionality is that you can’t use the control button to adjust the volume directly from the earbuds, which is a little inconvenient. The palm sized portable charging station, weighing just under 3 oz., is a perfect size for throwing in a purse or pocket, and comes in handy for extending the 2-3 hour listening time of the earbuds. Once fully loaded to its 2100 mAh capacity, the dock can recharge your earbuds 15 times, so you can listen to music for a couple days before having to recharge the power bank. You can also recharge your cell phone 1 time with a fully charged dock. To charge the earbuds, you just pop them into the magnetic, conductive charging holes in the dock, and slide the outer sleeve up so they’re fully encased. When the LED indicator shows they’re finished charging, just slide the sleeve back down and take your earbuds out. Powered on, the earbuds will hold a standby charge for a full day, and powered off, they can hold a charge for 3 months. You can recharge the dock with the included mini-USB/Universal USB charging cord, using a computer or an AC adaptor. The Bit Charge Stereo Earbuds are pretty cool, though there are some things I’d change on future models. 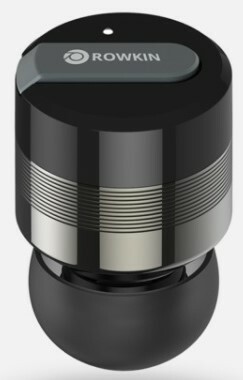 Like I mentioned before, I’d like the eartip and body of the earbuds to be able to pivot for a more personalized fit, and I’d also like to be able to control the volume of my music and calls directly from the earbud control button, instead of having to access it by handling my phone or talking to my mobile assistant. 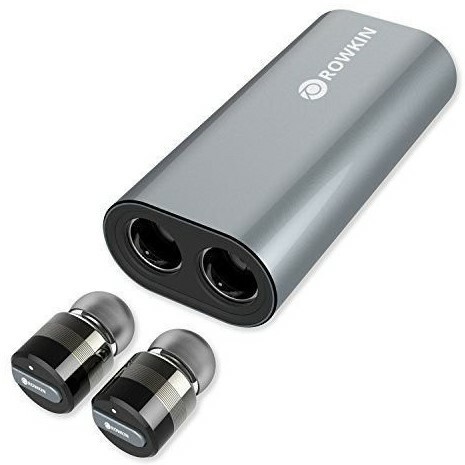 Still, the innovation of the earbud/charger combo, the sound quality, overall fit and function of the earbuds, and capacity of the portable charger make this a product I am more than happy to recommend to you. Head on over to www.rowkin.com to check out this, and all the other great products available from Rowkin.